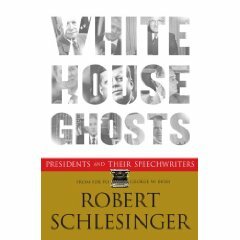 A review of a book which details the activities of White House Ghosts is appropriate not because it is Halloween; rather, it is appropriate because we are on the eve of a long overdue change in the Presidency. The Ghosts described in this book are not the spooky variety; they are ghost-writers – the professional speech writers whose job it is to put words into the mouth of the person occupying the most powerful office on earth. Hopefully they’ll soon have a more eloquent practitioner of spoken English to work with than the poor creatures who have had to avoid stepping on terms like ‘misunderestimated’. The book describes the men and women who acted as speech writers to every President from FDR in 1932 to George W. Bush in 2001. Each administration is given a chapter. Each President’s relationship with his speech writers is outlined with an analysis of one or more key speeches. Sometimes an Inaugural Address; sometimes the State of the Union address; or a speech on foreign or domestic policy; once a resignation speech. What’s fascinating is the unique relationship each President had with his speech writers and other close advisers. The games they played. The office politics. The late nights. Who ‘owned’ the speech and at what point and to what extent the President gave direction. The best were intimately involved. Sorensen and Kennedy were so close that someone observed “When Jack is wounded, Ted bleeds.” Carter kept speech writers at arms-length and “didn’t much like the idea of using them, ever.” It showed. In some administrations, White House staffers would rail against the power of a speech writer to make policy. In others, the speech writers were emasculated scribes left out in the cold. In the Clinton White House the speechwriters claimed that the president only stuck to the written text about half the time. (p. 408) The writers would boldface the text they needed him to say. Been there. Done that. I’m greatly looking forward to meeting both the author, Robert Schlesinger, and Ted Sorensen, the world’s greatest living speech writer, at the Ragan Speechwriters Conference in Washington DC in February. Ian: wow – just imagine the power that the Kennedy speechwriters who were defining policy had! Talk about the power of the written word! We have just established a Centre for Speech Development and Learning Initiative here in Nigeria. WE are possionate about the power of words just like Hayakawa.WE NEED SUPPORT to put our vision into friution. Can help come from anywhere or can our CENTRE get this ghreat book?